Single-ply roofing is rapidly becoming the latest roofing trend. So what exactly is single-ply roofing? It is a synthetic material that provides one waterproof later. At the joints, single ply sections are sealed by either heat or an adhesive. The reason they are becoming such a popular roofing substrate is because of their flexible, lightweight characteristics. They are also easier to install than other roofing membranes. TPO (Thermoplastic Polyolefin) – Compared to other roofing membranes, these roofing systems are more ECO friendly. They are an excellent option for clients looking for energy efficiency because they have superior UV ray sensitivity. PVC (Polyvinyl Chloride) – With numerous color and style options to choose from, it’s no wonder PVC roofs are so popular with business owners. They are easy to install, but are generally suited for new roofing projects. 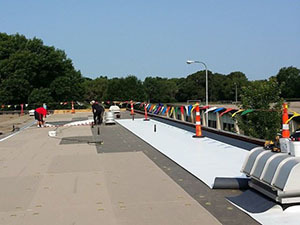 EPDM (Ethylene Propylene Diene Monomer) – EPDM (or more commonly known as rubber roofs) are known for their cost effectiveness. They are commonly black in color, but a roof coating can help increase energy efficiency. To learn more about which roof type is best suited for your facility, please give Capital Coating, Inc. a call at 717-442-0979. When you work with Capital Coating, Inc. we will put our twenty years of service to work for you. We will be sure to complete your project in a timely manner, and you can count on us to be there for you long after you work is complete. 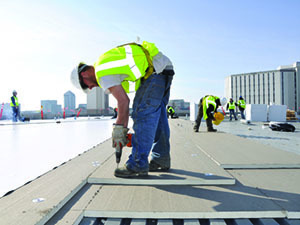 If you have a commercial or industrial facility located in or around Harrisburg, Pennsylvania and are in need of single-ply roofing services, call our office. You can reach us at 717-442-0979. One of our specialists will be happy to assist you in determining the best solutions for your needs.